City make it three wins in a row over Kingston University in a nail-biting encounter at Varsity 2019. The Wolfpack were in full voice to watch City edge out a 37 – 35 win over Kingston University in the three day sporting event, Varsity. Check out the full post match Varsity coverage on City's IGTV. A head of the competition the camps were in high spirits with Women’s Hockey, Women’s Volleyball and Women’s Netball all topping their divisional leagues. The rugby teams also received an additional pep talk from Rugby World Cup winner, Matt Dawson during a visit to CitySport . Victories came in Men’s Futsal, Men’s Volleyball, Women’s Volleyball, Women’s Hockey, Men’s Badminton, Women’s Basketball, Men’s Basketball, Men’s Tennis and cricket. Chiara De Vito, (BSc Accounting and Finance) and co-captain of the Women’s Volleyball Team, said: “It is my last year at City, so I am feeling sad, but I cannot be more proud of the team as to win three years in a row is an amazing achievement. 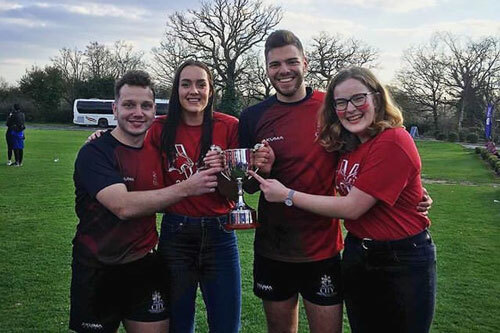 This year City students were invited to take more organisational control of the event, with Varsity captains selected to assist with the games at both CitySport and Tolworth Court at Kingston. Giovanni Di Spirito, (BEng Aeronautical Engineering), and City’s Varsity captain said: “I said yes straightaway to being Varsity captain as sport means so much to me. “We were mainly tasked with promoting the events and getting people in to watch. The results have been fantastic with packed crowds at all our games. “I’d be lying if I said it was just me! We owe a lot to the other teams who came to watch and support each other, there is a real community here and all our teams have close relationships with each other. The atmosphere has been amazing and that is because we want everyone to succeed. Check out the post match coverage on City's IGTV. City students can join sports teams by registering on the Students’ Union website.